The emo vampire resurgence continues with the third in the series (the final chapter to be split up into two movies, Harry Potter-style). The redheaded vamp Victoria (whose lover was killed by Edward in the first chapter) is still baying for Bella's blood (her being the cause), and creates a vampire whom she grooms to build up an army to descend on Forks. 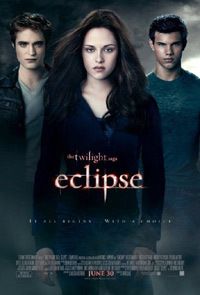 The Bella-Edward-Jacob / human-vampire-wolf triangle continues, and they have to stand together against the ensuing onslaught. With the hormones still raging, this will not disappoint the fans.